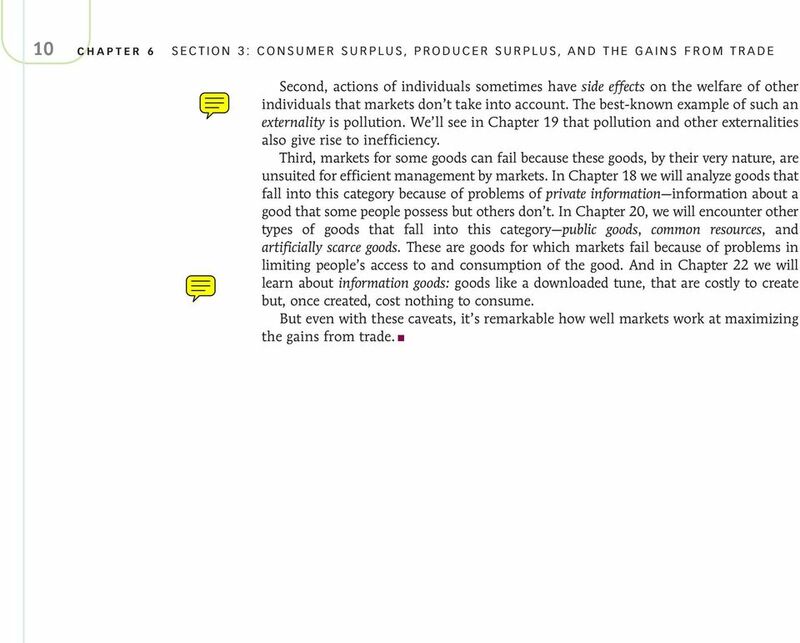 Download "chapter >> Consumer and Producer Surplus Section 3: Consumer Surplus, Producer Surplus, and the Gains from Trade"
3 3 CHAPTER 6 SECTION 3: CONSUMER SURPLUS, PRODUCER SURPLUS, AND THE GAINS FROM TRADE The total surplus generated in a market is the total net gain to consumers and producers from trading in the market. It is the sum of the producer and the consumer surplus. market. The sum of consumer and producer surplus is known as the total surplus generated in a market. The striking thing about this picture is that both consumers and producers gain that is, both consumers and producers are better off because there is a market in this good. But this should come as no surprise it illustrates another core principle of economics: there are gains from trade. These gains from trade are the reason everyone is better off participating in a market economy than they would be if each individual tried to be self-sufficient. But are we as well off as we could be? This brings us to the question of the efficiency of markets. The Efficiency of Markets: A Preliminary View Markets produce gains from trade, but in Chapter 1 we made a bigger claim: that markets are usually efficient. That is, we claimed that once the market has produced its gains from trade, there is usually no way to make anyone better off without making someone else worse off (with some well-defined exceptions). We re not yet ready to carry out a full discussion of the efficiency of markets that will have to wait until we ve looked in more detail at the behavior of producers and consumers. 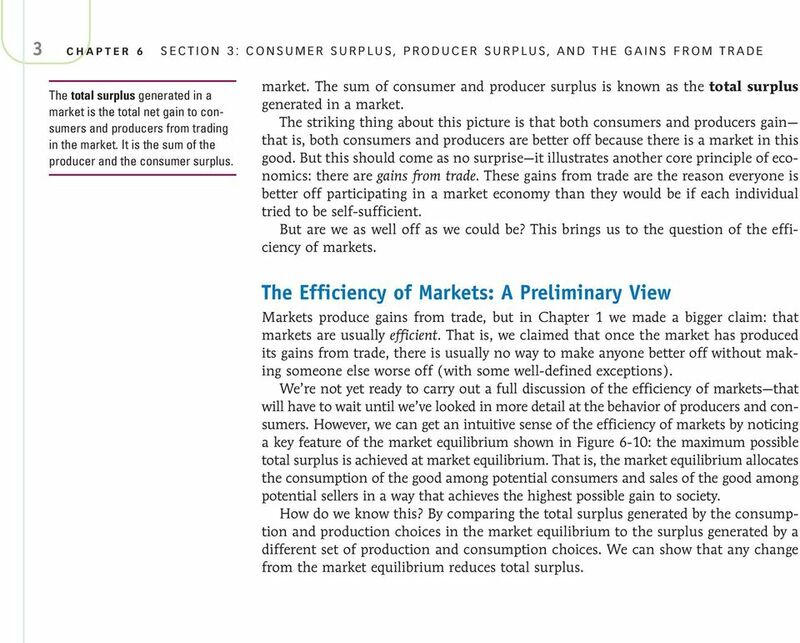 However, we can get an intuitive sense of the efficiency of markets by noticing a key feature of the market equilibrium shown in Figure 6-10: the maximum possible total surplus is achieved at market equilibrium. That is, the market equilibrium allocates the consumption of the good among potential consumers and sales of the good among potential sellers in a way that achieves the highest possible gain to society. How do we know this? By comparing the total surplus generated by the consumption and production choices in the market equilibrium to the surplus generated by a different set of production and consumption choices. We can show that any change from the market equilibrium reduces total surplus. 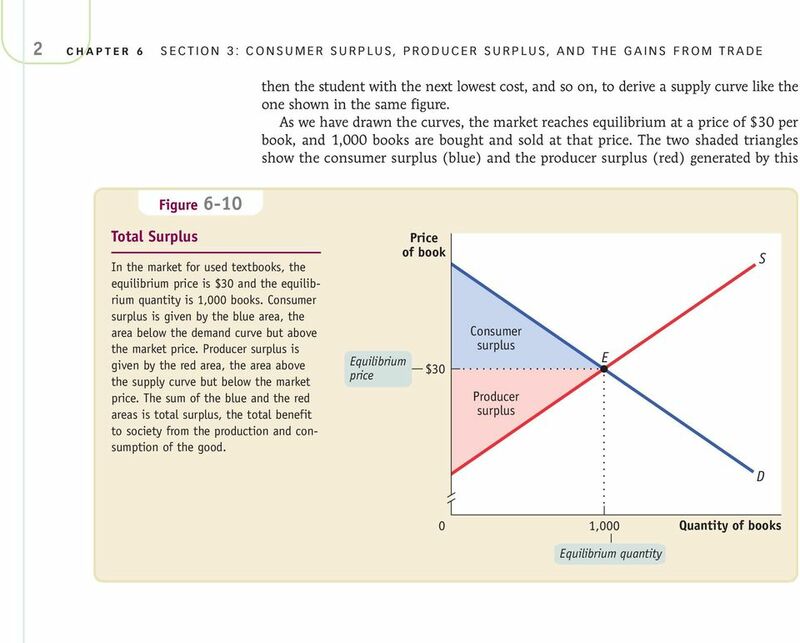 4 4 CHAPTER 6 SECTION 3: CONSUMER SURPLUS, PRODUCER SURPLUS, AND THE GAINS FROM TRADE Let s consider three ways in which you might try to increase the total surplus: 1. Reallocate consumption among consumers take the good away from buyers who would have purchased the good in the market equilibrium, and instead give it to potential consumers who would not have bought it in equilibrium. 2. Reallocate sales among sellers take sales away from sellers who would have sold the good in the market equilibrium, and instead compel potential sellers who would not have sold the good in equilibrium to sell it. 3. Change the quantity traded compel consumers and producers to transact either more or less than the equilibrium quantity. It turns out that each of these actions will not only fail to increase the total surplus; in fact, each will reduce the total surplus. 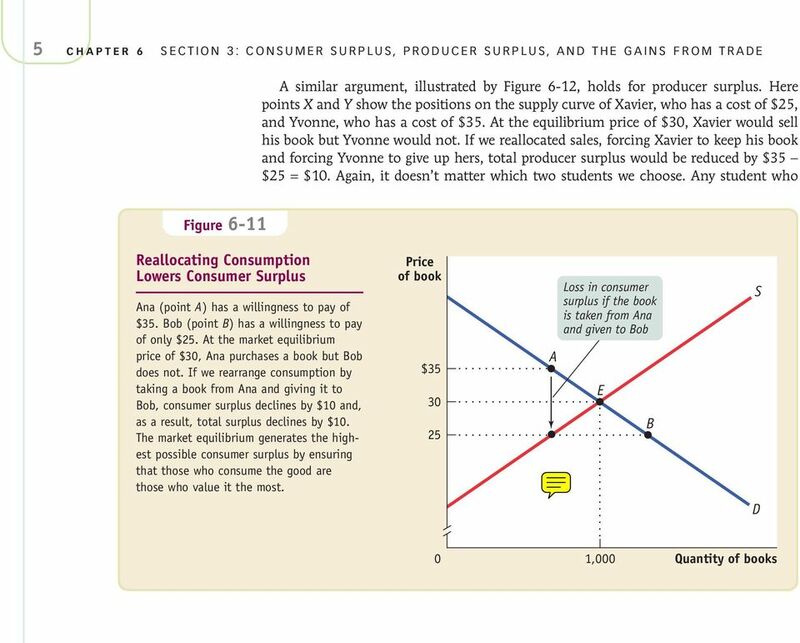 Figure 6-11 shows why reallocating consumption of the good among consumers will reduce the total surplus. Points A and B show the positions on the demand curve of two potential buyers of a used book, Ana and Bob. As we can see from the figure, Ana is willing to pay $35 for a book, but Bob is willing to pay only $25. Since the equilibrium price is $30, Ana buys a book and Bob does not. Now suppose that we try to reallocate consumption. This would mean taking a book away from somebody who would have bought one at the equilibrium price of $30, like Ana, and giving that book to someone who would not have bought at that price, like Bob. 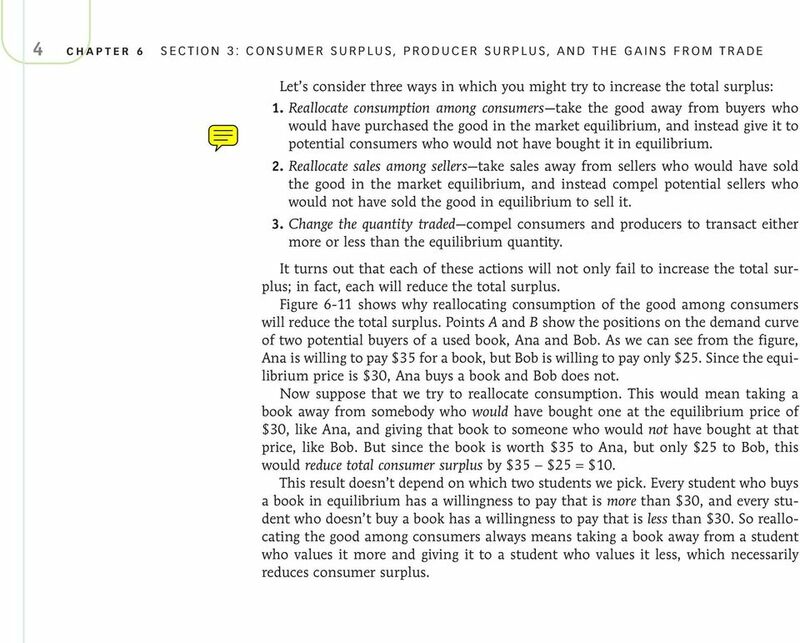 But since the book is worth $35 to Ana, but only $25 to Bob, this would reduce total consumer surplus by $35 $25 = $10. This result doesn t depend on which two students we pick. 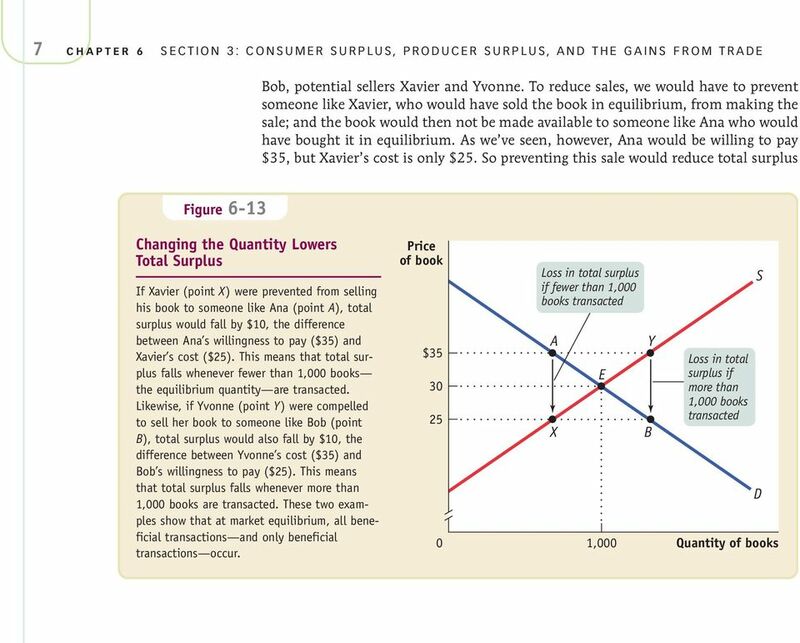 Every student who buys a book in equilibrium has a willingness to pay that is more than $30, and every student who doesn t buy a book has a willingness to pay that is less than $30. So reallocating the good among consumers always means taking a book away from a student who values it more and giving it to a student who values it less, which necessarily reduces consumer surplus. 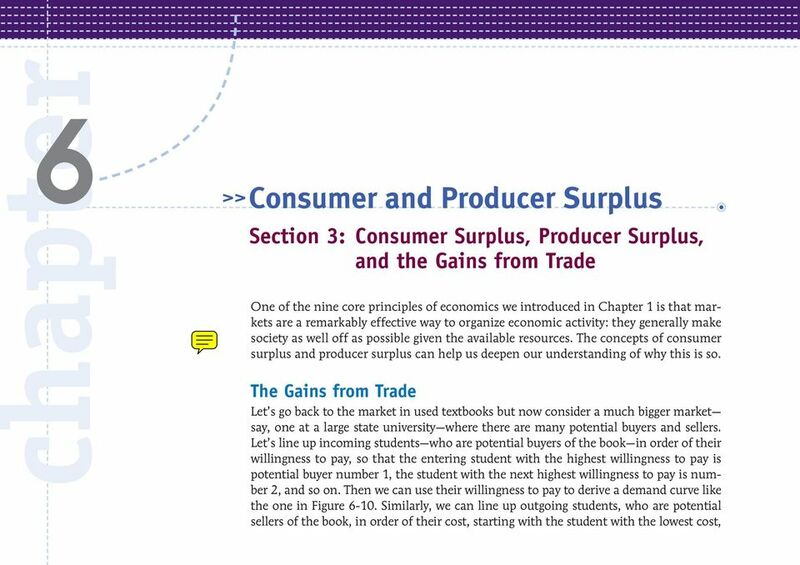 9 9 CHAPTER 6 SECTION 3: CONSUMER SURPLUS, PRODUCER SURPLUS, AND THE GAINS FROM TRADE price controls discussed in Chapter 4. A price ceiling that held down the market price would leave some consumers those who managed to make a purchase better off than they would be at equilibrium. A price floor that kept the price up would benefit some sellers those who managed to make a sale. But in the market equilibrium there is no way to make some people better off without making others worse off and that s the definition of efficiency. Market failure occurs when a market fails to be efficient. A Few Words of Caution Markets are an amazingly effective way to organize economic activity; we ve just demonstrated that, under certain conditions, a market is actually efficient there is literally no way to make anyone better off without making someone else worse off. But how secure is this result? Are markets really that good? The answer is not always. As we discussed briefly in Chapter 1 in our ninth and final principle of economics (when markets don t achieve efficiency, government intervention can improve society s welfare), markets can fail to be efficient for a number of reasons. When a market is not efficient, we have what is known as a case of market failure. We will examine various causes of market failure in depth in later chapters; for now, let s review the three main reasons why markets sometimes fall short of efficiency in reality. First, markets can fail when, in an attempt to capture more resources, one party prevents mutually beneficial trades from occurring. This situation arises, for instance, when a market contains only a single seller of a good, known as a monopolist. In this case, the assumption we have relied on in supply and demand analysis that no individual buyer and seller can have a noticeable effect on the market price is no longer valid; the monopolist can determine the market price. 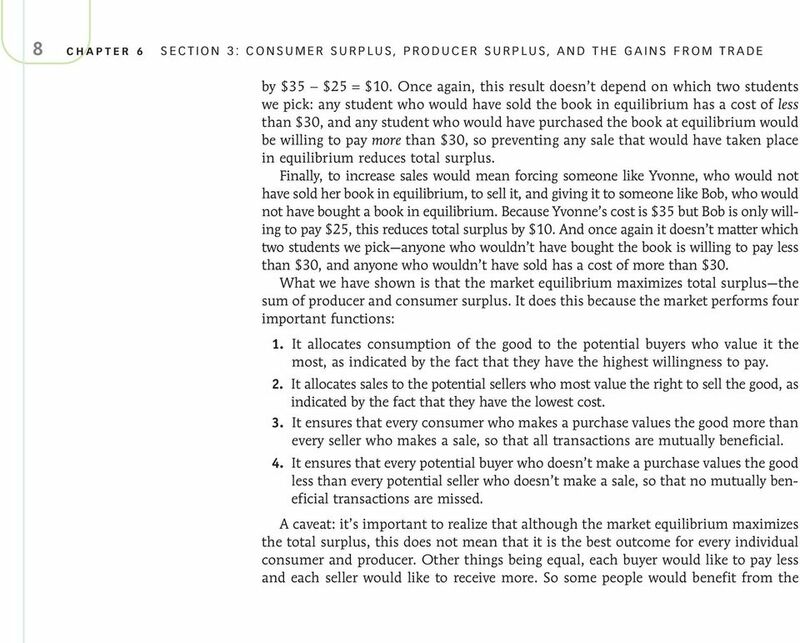 As we ll see in Chapter 14, this gives rise to inefficiency as a monopolist manipulates the market price in order to increase profits, thereby preventing mutually beneficial trades from occurring. 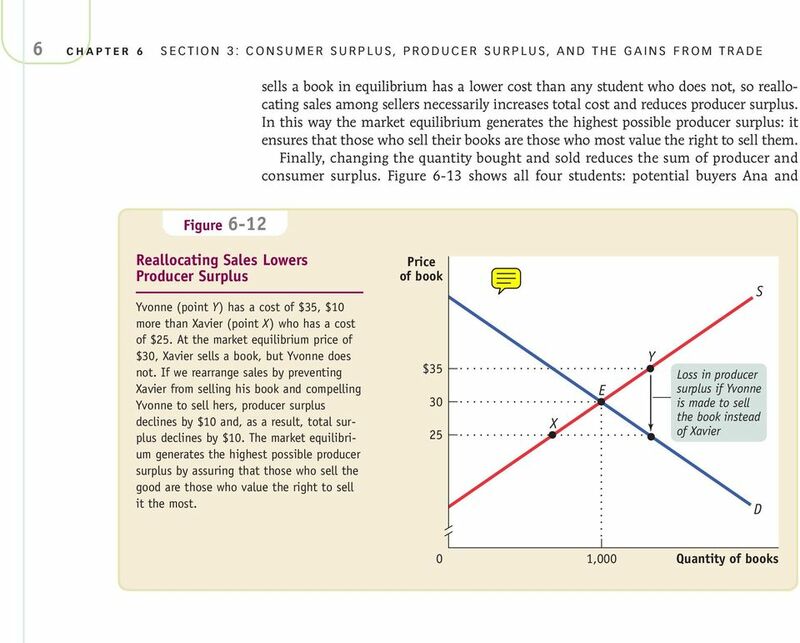 10 10 CHAPTER 6 SECTION 3: CONSUMER SURPLUS, PRODUCER SURPLUS, AND THE GAINS FROM TRADE Second, actions of individuals sometimes have side effects on the welfare of other individuals that markets don t take into account. The best-known example of such an externality is pollution. We ll see in Chapter 19 that pollution and other externalities also give rise to inefficiency. Third, markets for some goods can fail because these goods, by their very nature, are unsuited for efficient management by markets. 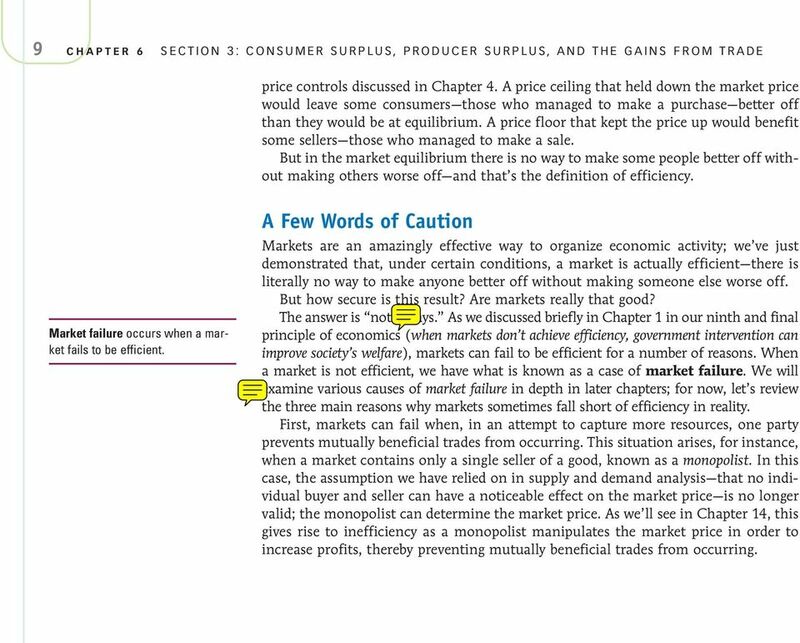 In Chapter 18 we will analyze goods that fall into this category because of problems of private information information about a good that some people possess but others don t. In Chapter 20, we will encounter other types of goods that fall into this category public goods, common resources, and artificially scarce goods. These are goods for which markets fail because of problems in limiting people s access to and consumption of the good. And in Chapter 22 we will learn about information goods: goods like a downloaded tune, that are costly to create but, once created, cost nothing to consume. But even with these caveats, it s remarkable how well markets work at maximizing the gains from trade. Notes - Gruber, Public Finance Section 12.1 Social Insurance What is insurance? Individuals pay money to an insurer (private firm or gov). Microstructure 2 Tutorial Introduction Welcome to Rotman Interactive Trader (RIT). This document begins assuming that you have installed and run the Rotman Interactive Trader client application (RIT Client). As you move your cart down the grocery isle, stop in front of the canned soups. You see before maybe four or five different brands of soup. Effective Replenishment Parameters. By Jon Schreibfeder EIM. Effective Inventory Management, Inc. Figure 1. Quantity (tons of medicine) b. What is represented by the vertical distance between the two supply curves? Optimal Auctions. Jonathan Levin 1. Winter 2009. Economics 285 Market Design. 1 These slides are based on Paul Milgrom s.
The Economics of Demand-Side Financing Commissioned by The Dutch Ministry of Economic Affairs SEOR-ECRI www.ecri.nl Prof.dr. M.C.W. Janssen drs. E. Maasland dr. E. Mendys-Kamphorst March 18, 2004 Abstract.